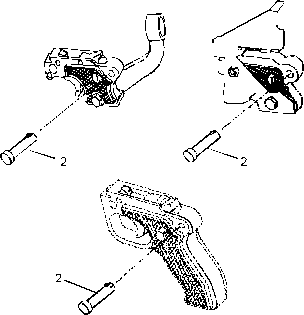 Both barrels and bolt assembly must accompany receiver when weapon is turned in. Solid Film Lubricant (SFL) is the authorized touchup for the M240 Series Machine Gun and may be used on up to one third of the exterior finish of the weapon. FOR CONUS USE ONLY: Solid Film Lubricant (item 6, WP 0074 00) may be used as a touchup without limitation on the receiver assembly. This is to say that the units which DO NOT fall under the category of Divisional Combat Units of rapid deployment type units may have up to 100% of the exterior surface of the receiver assembly protected with SFL. Prior to application of SFL, the surface must be thoroughly cleaned and inspected for corrosion and/or damage. If corroded or damaged, the part must be repaired or replace prior to application of SFL. Continued use under combat conditions would result in an unprotected surface when the SFL wears off. This would result in a large light reflecting surface and accelerated deterioration of the unprotected surface. Therefore, Divisional Combat Units, and units that fall under the definition of Rapid Deployment type must adhere to the limitation of NOT over one third of their exterior surface covered by SFL. If M240 Series Machine Gun RECEIVER ASSEMBLY is missing one third or more of its exterior protective finish, resulting in an unprotected/light-reflecting surface, it is a candidate for overhaul. This missing finish will be considered a shortcoming. This shortcoming requires action to obtain a replacement weapon. Once a replacement has been received, evacuate the original weapon to depot for overhaul. When a machine gun is received at unit maintenance, all gaging requirement compliance dates must be checked, and ensure the barrels are tagged to the receiver. 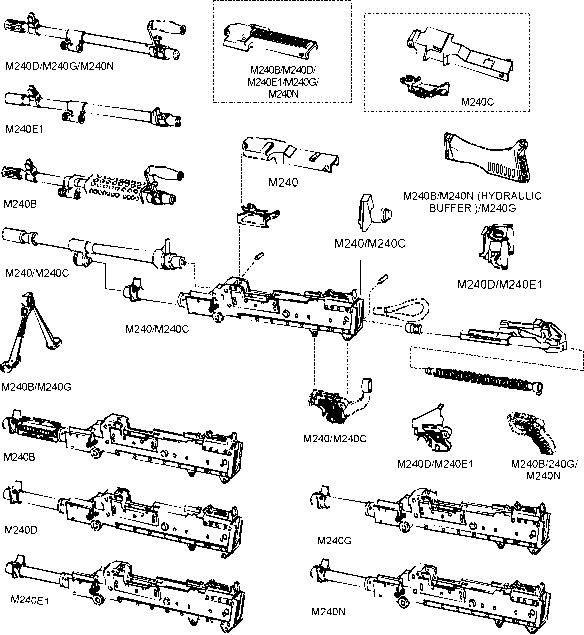 In addition, the machine gun must be inspected and, if any deficiencies are found, repaired or noted for repair at the direct support level. Both barrels and bolt assembly must accompany receiver when weapon is turned in for maintenance. Do not mix lubricants on the weapon. The weapon must be thoroughly cleaned during change from one lubricant to another. Cleaning solvent (item 4, WP 0074 00) is recommended for cleaning during change from one lubricant to another. Make certain weapon is cleared and that there is no obstruction in the barrel or chamber. Field-strip in accordance with TM 9-1005-313-10. Remove dirt and corrosion or powder residue from parts with wiping rag (item 11, WP 0074 00) dampened with RBC/CLP (item 1 and item 2, WP 0074 00). Lightly lubricate as required. Visually inspect all parts for damage. See appropriate maintenance procedure for repair. Inspect external surfaces for proper fi nish (black surfaces should not reflect light). See appropriate maintenance procedure for refinishing instructions. Replace driving spring rod assembly (1) if two or more strands are broken on the same coil, or if there are three or more broken strands, regardless of location, on the spring. 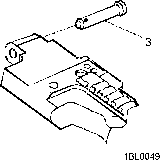 Replace trigger spring pin (2) if it is bent or if spring portion of pin is damaged. Replace cover hinge spring pin (3), if bent or damaged. Cleaning solvent is FLAMMABLE and TOXIC and must be kept away from open flames and used in a well-ventilated area. Use of rubber gloves is necessary to protect the skin when washing weapons parts. Clean rusted or shiny surfaces with crocus cloth (item 3, WP 0074 00). Wash thoroughly with cleaning solvent (item 4, WP 0074 00). Do not mix lubricants on the same weapon. The weapon must be thoroughly cleaned with cleaning solvent before changing lubricants. For baked-on carbon use solvent cleaning compound (RBC) (item 2, WP 0074 00) on machine gun and wipe dry. If solid film lubricant comes in contact with any internal or moving part, clean part with RBC. To all external surfaces showing wear, clean thoroughly with cleaning solvent (item 4, WP 0074 00) and dry completely. Apply solid film lubricant (item 6, WP 0074 00) and allow 12 hours to dry before using weapon. Reassemble in accordance with (TM 9-1005-313-10). Check out machine gun using dummy ammo (TM 9-1005-313-10). If barrel or spare barrel is damaged on M240 series machine gun, evacuate both, along with the weapon, to direct support maintenance. What is the driving spring rod assembly?